Part V. Higher-order logic and logical frameworks. Chapter 15. Classical Type Theory (Peter B. Andrews). Chapter 16. Higher-Order Unification and Matching (Gilles Dowek). Type Theory and Other Set Theories. Unification in &lgr;-calculus with Dependent Types. Chapter 17. Logical Frameworks (Frank Pfenning). Appendix: the dependently typed &lgr;-calculus. Chapter 18. Proof-Assistants Using Dependent Type Systems (Henk Barendregt, Herman Geuvers). Type-theoretic notions for proof checking. Type systems for proof checking. Chapter 19. Nonmonotonic Reasoning: Towards Efficient Calculi and Implementations (Jurgen Dix, Ulrich Furbach, Ilkka Niemela). From Automated Reasoning to Disjunctive Logic Programming. Nonmonotonic Semantics of Logic Programs. Chapter 20. Automated Deduction for Many-Valued Logics (Matthias Baaz, Christian G. Fermuller, Gernot Salzer). What is a many-valued logic? Classification of proof systems for many-valued logics. Signed logic: reasoning classically about finitely-valued logics. Chapter 21. Encoding Two-Valued Nonclassical Logics in Classical Logic (Hans Jurgen Ohlbach, Andreas Nonnengart, Maarten de Rijke, Dov M. Gabbay). Chapter 22. Connections in Nonclassical Logics (Arild Waaler). Prelude: Connections in classical first-order logic. Normal modal logics up to S4. Part VII. Decidable classes and model building. Chapter 23. 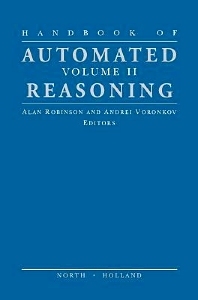 Reasoning in Expressive Description Logics (Diego Calvanese, Giuseppe De Giacomo, Maurizio Lenzerini, Daniele Nardi). Description Logics and Propositional Dynamic Logics. Chapter 24. Model Checking (Edmund M. Clarke, Bernd-Holger Schlingloff). Chapter 25. Resolution Decision Procedures (Christian G. Fermuller, Alexander Leitsch, Ullrich Hustadt, Tanel Tammet). Decision procedures based on ordering refinements. Resolution decision procedures for description logics. Chapter 26. Term Indexing (R. Sekar, I.V. Ramakrishnan, Andrei Voronkov). Data structures for representing terms and indexes. A common framework for indexing. Chapter 27. Combining Superposition, Sorts and Splitting (Christoph Weidenbach). What This Chapter is (not) About. Bibliography. A Links to Saturation Based Provers. Index. Further Structural Refinements of Clausal Tableaux. Global Pruning Methods in Model Elimination. Architectures of Model Elimination Implementations. Implementation of Refinements by Constraints. University of Manchester, Computer Science Department, Oxford Road, Manchester, M13 9LP, UK.